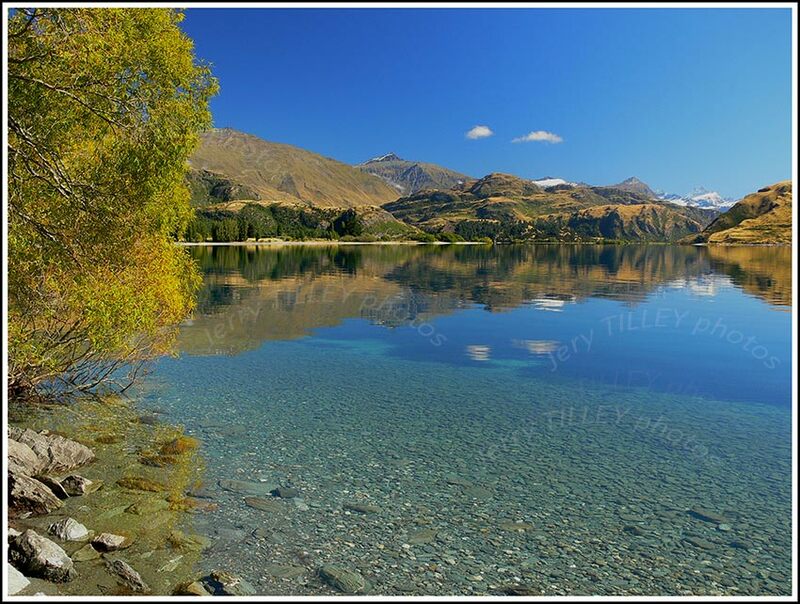 Happiness, Lake Wanaka, New Zealand – Not the Quality Spa Resort Hotel, Norefjell. Thought for the day….” The right angle to approach a difficult problem is the try-angle”. Wonderful news! Venezuela has appointed its first vice minister for happiness. Not only that, but it has also started a government section to encourage social happiness. The UN now publishes a world happiness report, and Bhutan has its index of happiness. But as usual, Denmark comes top of the world’s happiest countries, despite having high taxes, followed by Norway (even higher taxes) and then Switzerland. Bottom of the happiness table (or perhaps top of the UNhappy countries) was Togo, although Rwanda and Burundi were not far behind. Happiness is no laughing matter !! Another view of the stunning Lake Wanaka in New Zealand here, and near Glendu Bay. The water comes from the glaciers, and Mt. Aspiring National Park is visible in the background, with the snow-capped 3033m Mt. Aspiring on the right. Breaking records SPEED – Not the Quality Spa Resort Hotel, Norefjell. Thought for the day….”Out on the edge, you see all sorts of things that you cannot see from the centre”. 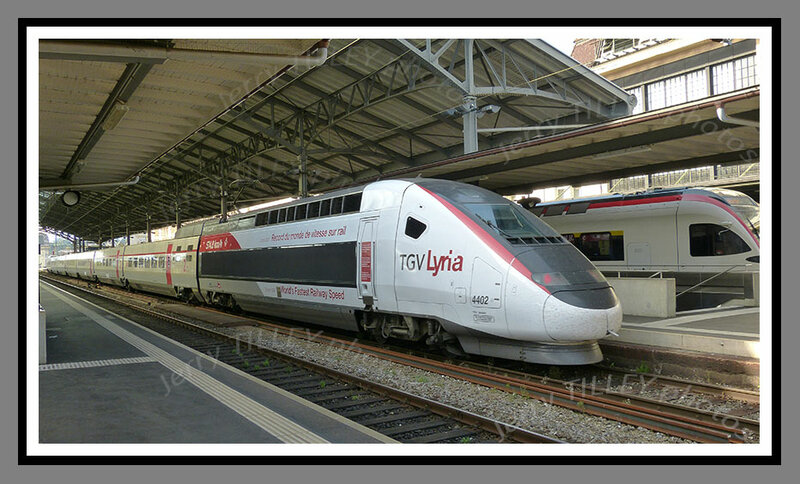 A photo today of the world record holder for conventional trains, the French TGV. The train, seen here in Lausanne station (Switzerland) carries a special paint scheme, and includes details of the world record which it broke on 3rd April 2007, when it achieved a top speed of 574.8 km/h. Although this is the world record for conventional trains (that is, those running on normal rails) the Japanese MAGLEV train set an overall train speed record of 581 km/h. At the other end of the scale, the world’s slowest train is said to be the last running train in Cambodia, which has a top speed of only 17 km/h. The normal top speed of the TGV (as in today’s photo) is 320 km/h, although there are plans to raise this in time. Finals to land – Not the Quality Resort Hotel, Norefjell. ” The past is to improve yourself, and the future is to prove yourself”. Another photo to prove that you do not need an expensive camera to get a good photo. Many modern ‘compact’ cameras offer great zooms (the new ones go up to an extreme 60X zoom!) , but even a 20X zoom will get you a photo like this. Good light and also a high shutter speed will give great results. Even though the aircraft was moving at around 260 km/h at this point, the high shutter speed of 1/2000th has given a good, sharp photo. Once again, the Panasonic Lumix camera has done well !! The Portuguese government is trying to sell TAP Airline, as part of its attempts to raise much needed funds. It has already sold the airports operations to a French company, but a recent bid by a Brazilian company for the airline fell through. The airline has huge debts and also a reputation for poor service. Color Magic inside – Not the Quality Spa Resort Hotel, Norefjell. ” Time is the longest distance between two places”. Some magic for the photo today, and the interior of the Colorline ‘Color Magic’ ferry, which sails between Oslo (Norway) and Kiel (Germany) in around 20 hours. The ferry is Norwegian registered, and is the largest ferry in the world, weighing in at 75 156 tons and carrying 2700 passengers. 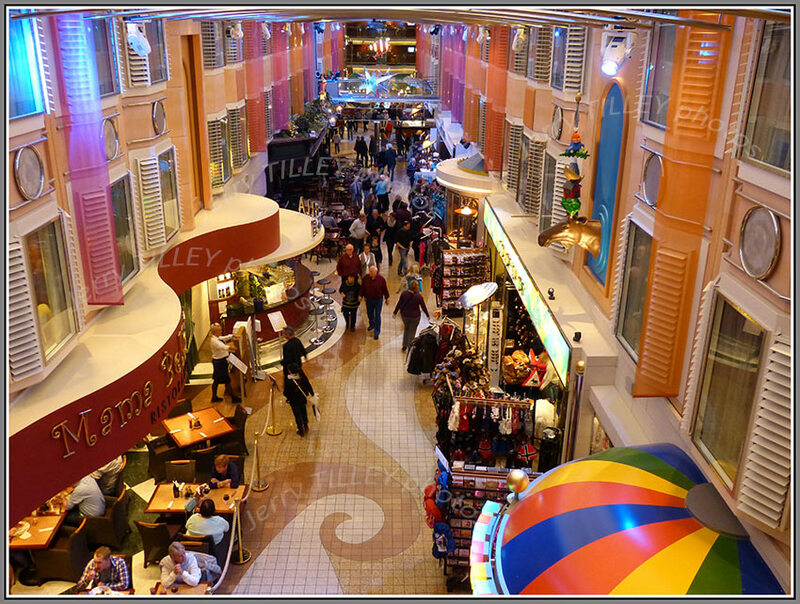 It has 15 decks, and a long promenade, as pictured below. The 223m long ferry was built in Finland (as many of them are) and has a top speed of about 41kmh/25mph. It can carry about 550 cars. Although it is the world’s largest ferry, it is still small when compared to the world’s largest cruise ship, the Allure of the Seas, which weighs in at 225 000 tons, and is capable of carrying over 6290 passengers. Not easy to get the white balance correct in this photo, as there were so many different lighting sources, but the Panasonic camera has done a good job to balance them all out. The photo was handheld and without flash. Waiting in the market – Not the Quality Spa Resort Hotel, Norefjell. Thought for the day….” If you cannot be thankful for what you achieve, then be thankful for what you escape”. ” The more that you live, the less that you die”. There are good airports in the world, and there are bad airports. Singapore (Changi) must rate as the best airport in the world, and changing aircraft there or just waiting is actually a pleasant experience. Well managed, clean and also lots of good facilities for travellers, such as free cinemas, gardens and even a swimming pool. And plenty of comfortable seats. Compare that to the Oslo Gardermoen (OSL) airport. They have taken away most of the seats in the terminal now, so that often the only option (apart from sitting in an expensive restaurant (which may be closed at night/early morning) is to sit on the floor. Their reply to my complaint was that it was due to pressure of space, so their answer is to take seats out. But it will be reviewed again in 2017 (yes, you read correctly, 2017!!). What are travellers supposed to do if they have to wait before they are able to check in? I sometimes wonder about the people managing airports such as Oslo Gardermoen. Not only is the lack of seats bad, but if you arrive off a long flight, then try getting a shower in the airport. Oslo Gardermoen (OSL) airport has facilities more like a 3rd world country, instead of a Scandinavian capital. 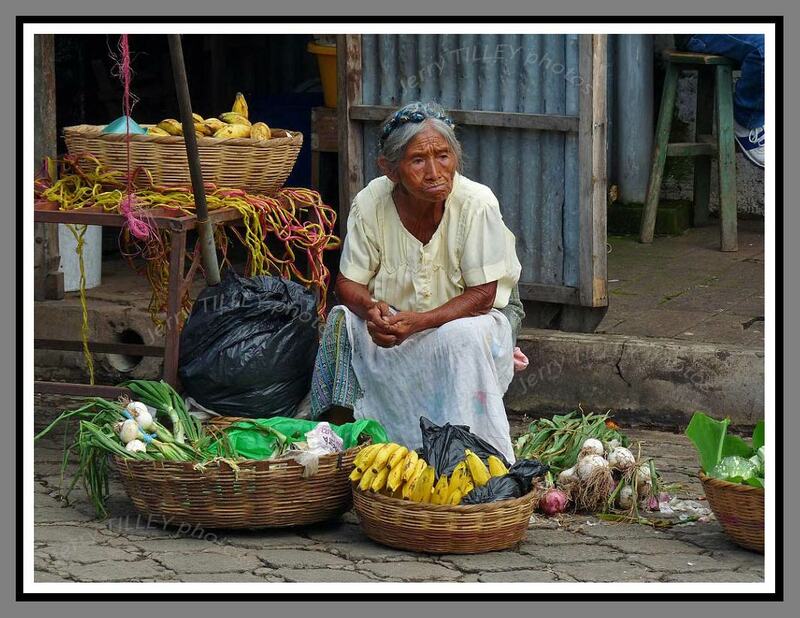 Staying in El Salvador again for the photo today, and a photo from the market in the town of Naza. Again, a very expressive face. The photo also makes a good crop as well, have a look at the small photo below and see if you like it better. Desperation in El Salvador – Not the Quality Spa Resort Hotel, Norefjell. Thought for the day…” A good idea without action is as pointless as a spear without a tip”. ” The hardest part of getting to the top is getting through the people at the bottom”. “Thank you for your Email alerting us to the problem you have been having with your refund .For further investigation , I would like to advise you to contact our Customer Care Department directly. How stupid is it that Air France claim that their Customer Care (and there is a misnomer if ever there was one) do not have an email address. They even answered my email to say that they do not have an email address! And how are people supposed to contact them? What a way to run a business. So if anyone from Air France is reading this, then get your act together. With a population of around 6 million, El Salvador is the smallest country in Central America. It has frequent earthquakes as it is on the Pacific Ring of Fire, , and also has around 20 volcanoes, with two of them active recently. A large part of its foreign earnings come from residents who work abroad, maninly in the USA. Sadly, it has one of the highest murder rates in the world, with drugs and gangs being prevalent. Spanish is the main language, and the US dollar is used as currency. A popular national dish is the pupusa, which is a corn tortilla, usually hand made and often filled with cheese or beans. Fried plantain is a popular breakfast item, as is deep fried cassava root. The capital, San Salvador, has around 2 million people, and lies in a volcanic valley. 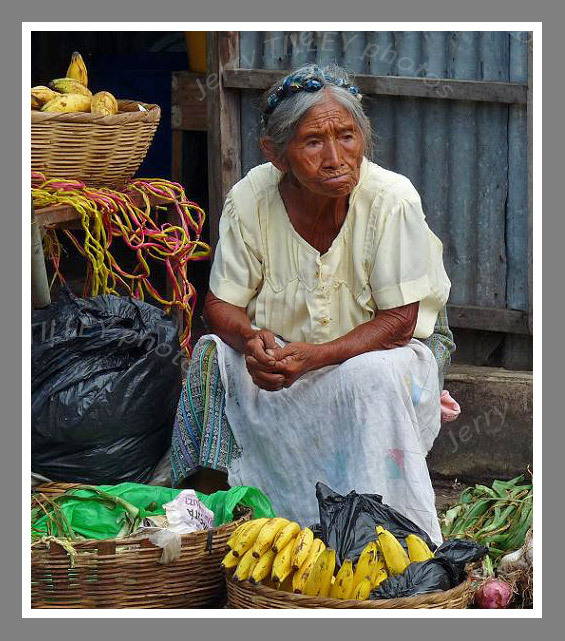 The photo here comes from the town of Naza, El Salvador, the look is either desperation, sadness or hopelessness. Another beautiful morning, Picton, New Zealand – Not the Quality Spa Resort Hotel, Norefjell. It became independent from Great Britain in 1907, and unusually, has 2 national anthems. Wellington, which is the capital (although Auckland is the largest city), is the southernmost capital city in the world. New Zealand also has one of the highest numbers of golf courses per capita in the world. You will not find any nuclear power stations or snakes in NZ, as NZ is snake and nuclear free. And in the far south, you may find the tuatara, the world’s oldest reptile, which is largely unchanged for the last 200 million years. 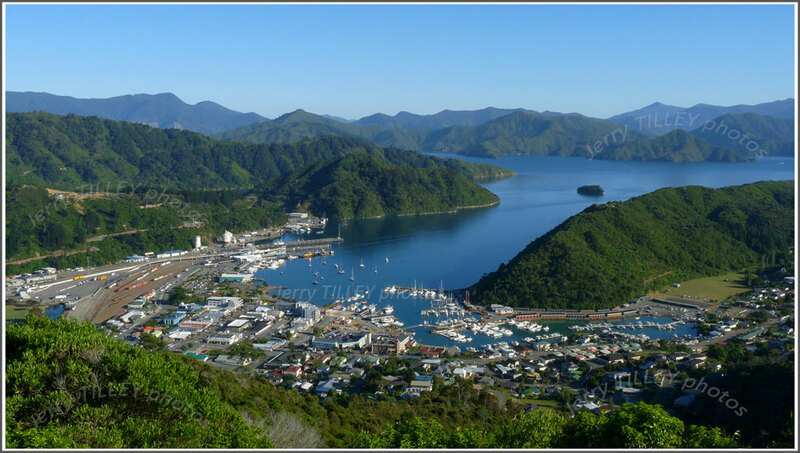 Too many tourists rush through the New Zealand town of Picton, which is situated at the top of the South Island. Many tourists only see it as the ferry port when they arrive on the 3 hour ferry trip from Wellington on the North Island. But this small town of about 4000 residents is a great holiday base, offering watersports (sailing, fishing, kayakking, diving), cycling and also the famous nearby Great Walk, the Queen Charlotte Track. And the famous Marlborough vineyards, including such famous wines as Cloudy Bay Sauvignon Blanc, are only a short drive away. Some fine small cafes, wonderful fish & chips (a New Zealand tradition) and excellent accommodation make this an ideal stop on a tour around New Zealand. Downtown Funchal, Madeira – Not the Quality Spa Resort Hotel, Norefjell. Thought for the day….” Life will not give you anything better than you give it. Give life the best, and you get the best out of life”. ” If the going seems easy, then check if you are going backwards”. Off to the islands of Madeira for the photo today. The islands are about 480km off the African coast in the Atlantic Ocean, but have an extremely pleasant year-round sub-tropical climate. Madeira was offically discovered by the Portuguese in 1419, and Portuguese is still the main language spoken there today. Today around 1 million tourists visit it each year, including by cruise ship. 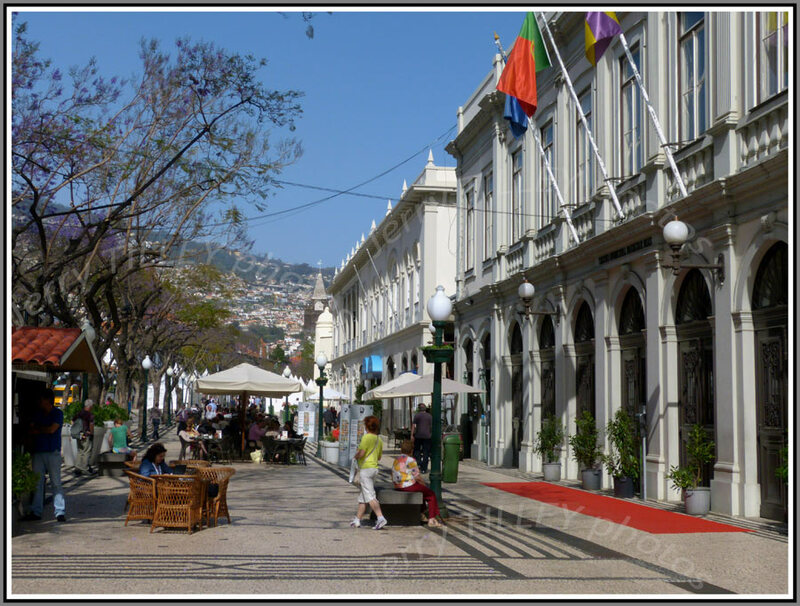 The photo here is of the main street in the capital, Funchal. Funchal has a population of about 111 000 people, and after Lisbon, is the richest part of Portugal. Finals to land – Not the Quality Spa Resort Hotel, Norefjell. Thought for the day….” He who has never made a mistake has never made a discovery”. ” The walls around you do not define the wealth within you”. Did you see the story from Brazil about a man in Sao Paulo who has buried a Bentley Continental Flying Spur car in his garden for his afterlife. The 62 year old businessman got the idea from the pharaohs in Egypt, and he plans to use it after his death. The car is worth around USD 400 000. Finals to land for the photo today…..and an Airbus A320 of the Portuguese airline TAP seen here about to land in Funchal on the island of Madeira. The landing speed will be around 120-140 knots (depending on the weight), or about 220km/h. The airline is based in Lisbon. The number of complaints online about this airline show that it has problems, with onboard service being the biggest area of complaint. The airline is owned by the Portuguese government, who are now trying to sell it to raise much needed funds. Swiss Bells – Not the Quality Spa Resort Hotel, Norefjell. Thought for the day….” A wise man can see more from the bottom of a well than a fool can see from the top of a mountain”. ” A ship in a harbour is safe, but that is not what ships are for”. I had forgotten just how good travel by train could be. I recently travelled down through Europe on long-distance night train, and it was very interesting to compare this trip with the return trip, which was by air. No early check in at an airport, no expensive airport ‘box’ hotel, and no long queues to endure. No silly security checks, and nobody on the train was worried that I was carrying toothpaste or liquids which at an airport would be taboo. No need to check in at all, just board the train and find the sleeping compartment. Pleasant evening on the way down through Europe, good snacks in the cafe, and coffee that was far better than airline coffee. And add to that a good nights sleep and it makes a very pleasant journey. Then next morning breakfast in the train cafe and voila, it was time to arrive (and on time too). Compare that to the hassle and frustration at airports and being squashed in economy class for the flight back. Flight back was late, on an old aircraft and delayed even further due to passengers travelling with far too many carry on bags. Perhaps one day the train will be THE way to travel again…….The recent trip was a very interesting comparison. 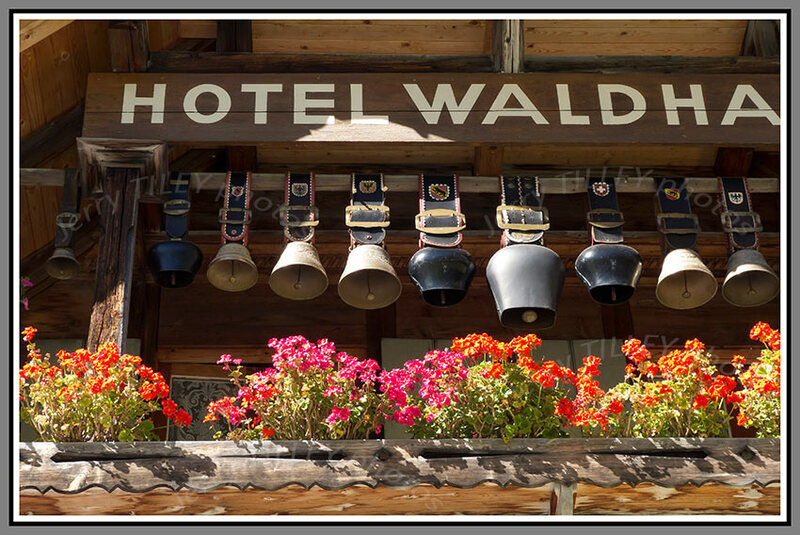 Today’s photo is from the central part of Switzerland, with a photo of Swiss cow bells on a woodland hotel. Very Swiss !